FINE ESTATE & VINTAGE JEWELRY. 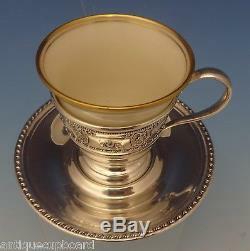 Rose Point by Wallace Sterling Silver Demitasse Cup with Saucer & Liner (#0600). Brilliant craftsmanship define this Rose Point sterling silver, sure to become a treasured family heirloom. The design of silver lace and a floating rose amidst deep scrolls and shimmering dew drops will grace your table and make every occasion special. 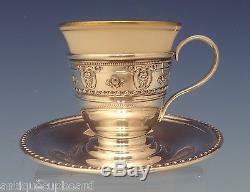 Rose Point by Wallace sterling silver demitasse cup with liner and saucer. &###xA0;The pieces are marked with #5-92. 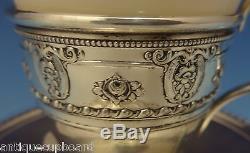 &###xA0;The measurements for the cup with liner are 2 1/2" tall and 2 1/4" wide, the saucer is 1/4" tall and 4" in diameter, and the total weight is 3.9 ozt. &###xA0;It is not monogrammed and is in excellent condition. Customer service is the foundation of all that we do. We sincerely appreciate the opportunity to earn your business. The item "Rose Point by Wallace Sterling Silver Demitasse Cup with Saucer & Liner (#0600)" is in sale since Wednesday, August 19, 2015. This item is in the category "Antiques\Silver\Sterling Silver (. The seller is "antiquecupboard" and is located in Waukesha, Wisconsin. This item can be shipped worldwide.